Installation is available please enquire in store. Gazebo measurements are taken from the outside of each pole. An additional 50cm to 70 cm needs to be allowed for the roof over hang. 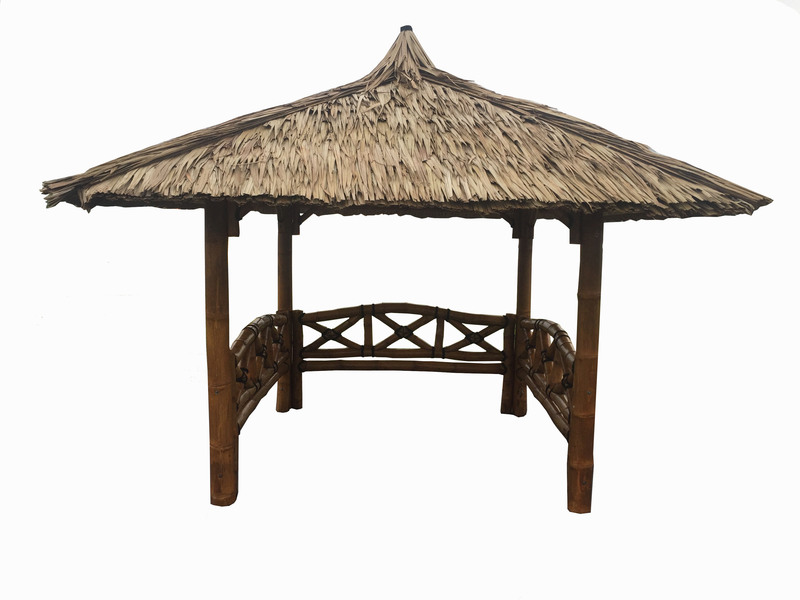 All Gazebos frames are made from Natural Bamboo. The top of the Gazebo roof is made of Palm leaf and the ceiling underlay is made from thatched Palm leaf. In between these two layers is a commercial grade plastic lining for full water proofing. Bamboo itself needs very little maintenance. You can protect your bamboo and give it a new lease of life with either decking oil or other oils containing a UV protector. It is not recommended that bamboo be sanded as this will damage its natural outer coat protection. Structurally Bamboo is stronger than steel. We use palm leaf for the roof which has been used in Java for 100’s of years where the Bali Hut originated from. We don’t recommend using Alang Alang or African straw in Australia, one of the main problems being it makes excellent birds nests and you may see your roof slowly disappear. Straw also compacts easily and does not allow air to circulate between the layers causing rot in the underbelly of the roof. Palm Leaf is the best choice as it is very strong, allows air to circulate and forms a waterproof barrier.